Musically, no detail is overlooked to re-create the true sound and excitement of The Beatles, with every song performed totally live and in its original key. Visually, our presentation is as close to the real thing as you can imagine... Close your eyes, could it really be them? 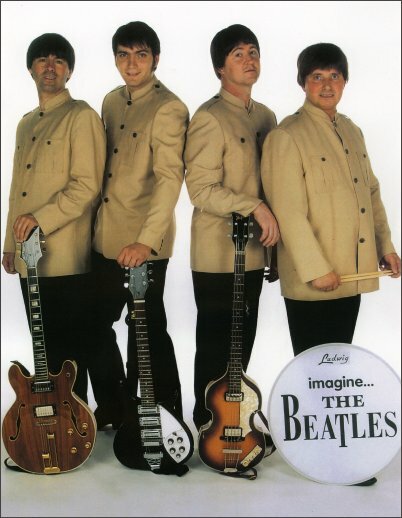 Quality stage outfits range from the early Cavern days through to Beatlemania and beyond. Authentic vocals and instruments, including the McCartney Hofner violin bass, Lennon's Rickenbacker, George's Gretsch and Ringo's Ludwig kit, complete the perfect tribute. The band comes equipped with a full PA system including lighting and also have their own excellent accompanying DJ should you require him. All of our equipment is P.A.T tested to industry standards, as is now required. A very accomplished all round musician, Geoff has been playing John since 1999, performing in such places as China, Singapore, Japan, Dubai and the US. Playing rhythm guitar, Geoff uses a Rickenbacker 325 through a Vox AC30. The founder member of the band, Rob's vocals and mannerisms are as close to the real thing as you could find. Born in London, Rob shares the exact same birthday as Sir Paul himself - 18 June, spooky! He plays a 1963 Hofner violin bass. James, like George, is the quiet one. A music teacher, his guitar skills are second to none. Playing George since 1996, he has performed in Japan, Singapore, Bangkok, Hong Kong, Africa, and throughout Europe. Considered to be at the top of his profession, James plays a Gretsch Country Classic through a Vox AC30. The bands driving force, without whom it would not be possible. Steve has studied Ringo for many a year and claims to be his long lost son! A good singer, he loves to show the other boys how it's done on - Yellow Submarine and With A Little Help From My Friends.